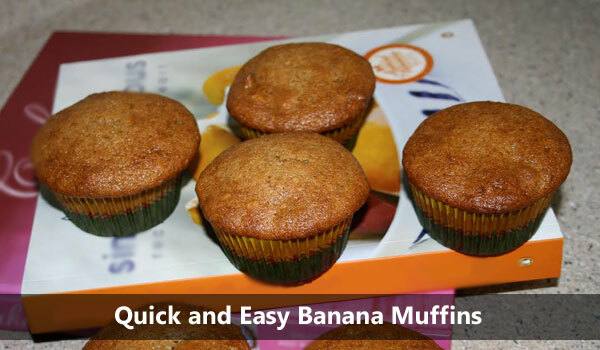 If you are looking for a quick and easy Banana Muffin recipe, then look no further. Between prep and baking this recipe, it only takes 30 minutes to complete. I prefer to make small batches since they are best eaten on the same day. 1. Peel bananas and mash 2 with a fork. Add 1 cup of sugar to the mashed bananas and whip up with a mixer until it is frothy. 2. Mash remaining bananas, leaving them a little bit chunky. Set aside for the time being. 3. Add in the oil and eggs to the sugar and banana mixture. Add the vanilla and then stir together. 4. Add the flour, baking soda, and salt. Stir until batter is well combined. 5. Place the remaining bananas in the bowl. If using, add the walnuts at this time. Stir gently until incorporated. 6. Grease a muffin pan, or use cupcake liners to prevent muffins from sticking. Use an ice cream scoop to fill the muffin tins. I have found this to be the quickest and easiest way to get the right amount of batter into each cup. 7. Bake the muffins for 20 minutes or until a toothpick inserted comes out clean. Enjoy warm, or as a healthy snack throughout the day. I dare you to try and walk by without grabbing one to munch on. Come back and let me know how your own muffins turned out. Kezia is originally from South Africa and spent her life traveling around the globe. She has recently made the move from Dallas, Texas to Denver, Colorado. She lives there with her husband and son. Soon to be the mom of two, Kezia is excited looking forward to a VBAC in mid 2014.